From an email sender perspective, spam is any email that an Internet Service Provider filters into a spam folder instead of the inbox. We take email deliverability very seriously and keeps adjusting our system to ensure we provide the best results. These days emails deliverability is more than just black and white - spam or not spam. Email providers are looking for the "legitimate" emails.. those that engage the readers. So, how do inbox providers determine what email is wanted and what email is not? Well, it’s all about engagement. Are the recipients of your email opening your messages or do they simply delete them from their inbox? Do recipients mark your messages as spam? Do they reply to your messages, or forward them to their friends, or move them to a folder in their inbox that’s not the spam folder? These are all things inbox providers such as Gmail and Yahoo are looking at to determine how engaged your recipients are with your messages. The more positive engagement signals they see for your mailings, the more certain they will be that your email is wanted and the better your inbox placement will be. On the other hand, negative engagement signals such as spam complaints or large amounts of emails going unopened are all factors that contribute to more of your emails being filtered to the junk folder. How can you achieve all this? Make sure you create content that your members will find helpfull and give them added value. Use the personalization - mail merge - option in your blasts to make your communication more personalized. Try to make your emails short and focused. Use images to make your emails more visual - but make sure your images are not too big and take long to load. Encourage replies and responses to your emails by asking them questions or their opinions/feedback. Ask your members to forward the email on to their friends and become your ambassadors. See who is not engaging with your emails and try to reduce the ammount of emails they get. Try to avoid continued sending to addresses that are full or “over quota.” If you see a large number of block reasons being returned that reference over quota or full inboxes, that’s a good sign that you are sending to unengaged addresses, as members with full mailboxes are typically those who aren’t just not engaging with your email, but aren’t engaging with their own inbox at all. You can see this information about your members in the MRM section. Q: Are you letting your members know what they can expect from you at the point they give you their email address? TIP: Use your membership emails to inform your members of what registrering for your community means, email wise. Q: Do you tell them how often you will be sending to them? TIP: You can let your members know in the group description/pinned post when they can expect your general communication. Q: Do you provide your members with options for how often they want to hear from you or options for what types of content they want? TIP: Let your members know from the beginning where their settings are and where they can choose the way they communicate with your group. The moment a person signs up for your email list is the moment they are most engaged with your brand. Making sure to send a welcome email goes a long way toward building your member's trust in your community. Those welcome emails are a great place to reinforce why they signed up, what they can expect, and why they want to look forward to your emails. 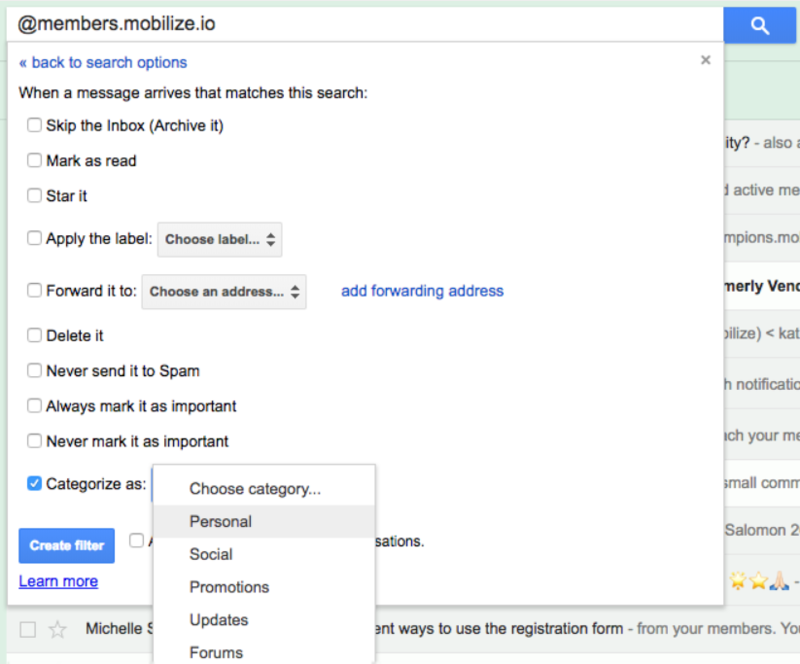 Members can also create a filter to mark anything coming from @members.mobilize.io as "Personal."